Amazon has received a patent for cushioning packages with inflatable air bags, so that a delivery drone could drop them from as high as 25 feet. That would allow the drone to conserve energy by minimizing changes in altitude as it flies. And no need to cover your head: the Seattle e-commerce giant has that — and the delivery box full of your precious items — covered, at least in theory. Amazon on Tuesday received a patent for cushioning packages with inflatable air bags, so they can be dropped from as high as 25 feet. The drone could inflate the “airlift package protection air bag” with a gas canister or even just from the downdraft from the aircraft’s propellers, while in transit or “near a drop location, such as a backyard or patio of a residential dwelling,” the patent said. Should you be, say, barbecuing on your patio when your delivery drone appears, there’s no reason to fear, but if you want your package, you’ll need to get out of the way — and take your bottles of beer with you — so it can fall from the sky. 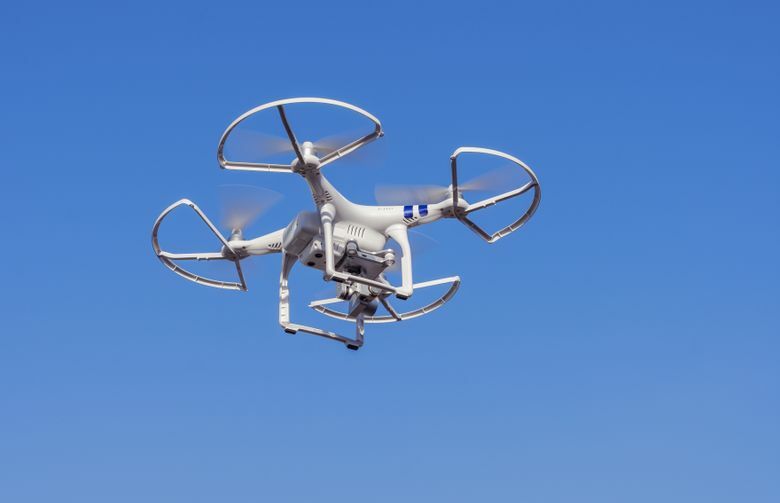 The drone could use cameras and other sensors to make sure the “drop zone” is empty of people, animals and “fragile objects,” and decline to make the delivery till all is clear, according to the patent. The air bag Amazon envisions would deflate slightly upon impact with the ground to cushion the landing and protect a package’s contents.